I don’t know why, but I think people miss out on the interesting part of Dresden when they take a day trip to the city. I’ve spoken to numerous people about it and when I ask “have you been to the cool part?” they look at me in disbelief!! Most often, people stay close to the main square (Altstadt) where you have museums, art galleries, and several major shopping centres. On a recent trip to Dresden, I took two friends who had previously been to Dresden’s main drag (the square) to the other side….namely Neustadt, and the hip Antonstadt (pictures below). I tried to put together a collection of pictures to give you a sense of the streetscape in the area. Antonstadt reminds me of what Queen Street West in Toronto used to be before it became overly commercial (at least the strip between University and Spadina) and perhaps what is now Parkdale (another Toronto reference). Antonstadt in Dresden is really cool area that is a bit grungy, hipster, arty, and creative. It is here, where you have lots of small boutiques, cafes, cheap bars and restaurants, outdoor markets, beautiful graffiti art (seems like a must for every German city! ), green grocers and live music. Every trip I make to Dresden includes a trip to the Antonstadt area; just to see what is going on. It is a vibrant community with lots of energy and people on the street. I love the vibe here. Antonstadt is where Lila Sosse is, the restaurant I blogged about before that serves its dishes in Weck Jars. Has anyone ventured to Dresden recently? I would love to hear about your favourite spots in this neighbourhood. Also, I have FINALLY created a Facebook Page for Lamb411. If you like what you read and you like what you see, hit the “Like” button and let me know 🙂 Thanks for helping to spread the word. It means a lot to this little blogger in Prague. To wrap up my finds from my last day trip to Dresden, I am going to share with you a secret store that has a phenomenal assortment of items for the home. I ventured off my typical day-trip grocery shopping route and found one more gem of a lifestyle/home accessory store called Schach Casa Colonial. I would describe Schach Casa Colonial‘s merchandise as predominantly French country with a mix of Scandinavian modern, vintage and Asian items. The company has been open for six years and has two stores in the city; I visited the one at Bautzner Landstrasse 7. From the store’s product mix of candles, glass and porcelain plates, serving dishes, tableware, planters, frames, lighting fixtures, buddha sculptures, jewelry and furniture- I give this place the Lamb411 seal of approval. This store was awesome. I mostly browsed the “outlet” section of the store as I wasn’t looking for anything in particular but I did finally cave for one of those oil fragrance things. I have been looking at the one’s by Ritual ever since I returned from the Lone Hotel in Croatia – see brands, it does work to put your products in hotels so customers can experience them!- but simply have not gotten around to picking one up. Finally, I noticed my fiance smelling a wall of these and found a scent we both liked. Sold. Our fragrance is now Hommage St. Jacques by Ipuro which is a muskier smell combining Brazilian tonka bean (which smells like vanilla, almond, cinnamon and cloves mixed together), Madagascar vanilla, star anise, caramel with a hint of tobacco. This is the second “keeper” store that I’ve found in Dresden this past year. There is another store on the other side of the river close to the main square that is two floors of eclectic home ware and furniture. I am blanking on the name, but next time I return to Dresden, I’ll be sure to stop in and take the name down. I recall the first time I stepped into this nameless store, I was referring to, I remember walking up to the sale associate and asking “Do you ship to Prague?” It’s that good! More fun things coming your way next week. One of the interesting, yet enjoyable dining experiences I had on my most recent trip to Dresden was the opportunity to experience German tapas, aka German comfort food, served in Weck jars at restaurant, Lila Sosse, located in the funkier, more artsy part of the city (Antonstadt). The entire concept and menu at Lila Sosse centers around offering food in jars. (It was the jars that drew me in) I like Weck jars and I know the dessert in jar trend is pretty hot these days, so I thought to myself, how bad could German food in jars be? Like any other restaurant (the type that serve food on plates) Lila Sosse’s menu is broken down into the usual appetizers like soup or salad, hot and cold items as well as a list of desserts. Their menu boasted dishes such as roast beef with celery and carrots (in a jar), beef cheeks with potato, rosemary and beans (in a jar), cold dark beer beef with horseradish (in a jar) and a wild herb salad with strawberries, mozzarella and apple balsamic vinegar (in a jar). Unfortunately we arrived at the restaurant a bit too early for a full meal so we each ordered one jar as a late afternoon snack. Our order consisted of the goat cheese and beet salad jar and a panna cotta jar. I was satisfied with my salad jar and had a fun time looking at the stacks of jars being carried out of the kitchen to other diners sitting on the patio and dining inside. To be quite honest with you, I don’t know how many jars I could eat for a full meal as this one jar was filling on its own. Nonetheless, it looked liked tables were ordering several jars to share (it is tapas after all). If German cuisine is not your thing, I think trying out this restaurant purely out of curiosity might be fun (and the food is decent). Who knows, Lila Sosse could be on to something in Dresden and you might see more jar-dished restaurants popping up globally, or has this trend already gotten started? What do you think about the idea? Leave me a comment below. Have you dined a la jar? Here are some other people who seem to be catching on to the dining a la jar movement! Dresden never struck me as a city I would go to dine. Of course every city has their fair share of fine dining establishments and interesting restaurant concepts, but the dining scene in Dresden (in my opinion) is polarized between touristy-chain restaurants, and traditional German beer halls. Oh, I forgot- you can also find great curry wurst joints in Dresden that are a local treat, but theses are in a category of their own. The point is, I would not purposely drive to Dresden to dine. It is simply not one of the great dining cities of Europe. However, that does not mean that it is impossible to find a gem from time to time. This past time, was one of those times where I stand corrected by restaurant and take-away deli, Bean & Beluga by chef Stefan Hermann. I don’t remember how exactly I found Bean & Beluga. All I knew was that it was located on “the other side” of the river, in a hilly, villa area on the north side of the Elbe river. I wanted to check this area out because I remember driving through it once (by mistake) and recalling how beautiful it was with the houses and trees and views over the river. We arrived at noon to an empty restaurant (not always the best sign) and after a quick look at the menu, decided it was too upscale for a lunch and decided to leave after our effort to find the place. What we really wanted was a sandwich and a salad, something fast as we were going biking later on. The waiter who greeted us picked up on our dissatisfaction and assured us that we could order a chicken club sandwich off menu and the kitchen would be happy to accommodate us. I was blown away. I think we both were by his excellent customer service and reassuring response, so we sat back down out of curiosity. Not too long after sampling their bread platter with olive oil and specialty flavoured salts, we received two delicious chicken club sandwiches with a juicy chicken breast served on fresh olive bread, homemade that day. We found out the restaurant makes all their own bread and desserts daily and would return just to sample another slice. It was to die for. Stuffed from our sandwich, we let the waiter talk us into tea, espresso and a plate of cookies to accompany our drinks. I think the waiter phrased the up-sell something to the effect of “who wouldn’t want fresh chocolate chip cookies to go with tea (Kusmi) and coffee?” It’s true? How can you debate with that question? Who wouldn’t want chocolate chip cookies, baked today, with tea? We got the cookies and they were good. Bean & Beluga also has a deli at the front of its building that has a lovely selection of take-away food *yet no sandwiches* jams in Weck jars, olive oils, spices, wines, balsamic vinegars and candies. Adorable! The other standout part about Bean & Beluga is the washrooms. I’m not one to comment on washrooms, but this one was on a level. It was the rock star of washrooms with pink lights, and stag heads and electronic sinks. By electronic sink, I mean you push a button on the sink to make the water hotter or cooler as well as to turn it on and off. I’ve never seen anything like this before in my life. What a pleasant surprise. I am happy we were talked into staying and didn’t leave. Next time, I would like to try their dinner. As we were feasting on our sandwiches the lunch crowd filled up the room and I saw some impressive looking dishes come out of the kitchen, including a couple who were sharing an entire bottle of champagne at noon! Gotta love the European lifestyle. I am so annoyed with my camera right now. I went to Dresden for the day on Saturday, took all these fabulous pictures of things I wanted to share with you, (did no biking as a result) and was all ready to blog about my experience. What do I get as I go to download the files? A memory card error stating that the card is empty. Where did my pictures go? I know they are not lost for good as I can see some of them but for some reason they are housed elsewhere. Urgghhhhh. Once I get this problem remedied, I will blog about the incredible, an rather unexpected lunch I had at Bean & Beluga in Dresden as well as a new restaurant concept where your meal – essentially German tapas- is served to you in Weck jars. More on those spots later this week. For now- I also discovered a cool bracelet/bangle jewelry line from Copenhagen (Nørrebro district), Denmark called Tokyo Jane. Their bracelets and bangles are a mix of metal and leather, some have patterns, some have bling, some are colourful, and some are neutral. The Tokyo Jane bracelets can be worn on their own or stacked all together depending on how much of a wrist statement you would like to make. You can also see more from Tokyo Jane on their blog. I am thinking about these as potential bridesmaid gifts…. What do you think? 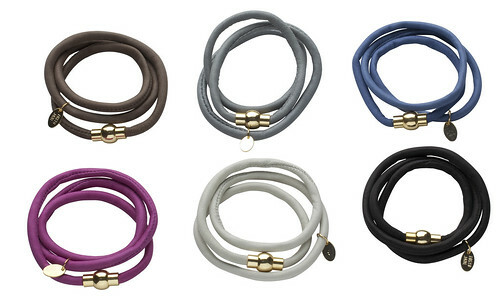 I treated myself to a leather bracelet that looks like the sixth from the left (in picture below) but instead of gold the links mine is silver and instead of felt, my bracelet is made of a smooth taupe-y leather. I love it! I think it is their 1015 bracelet. This past weekend, my fiance and I drove to Dresden, Germany to attend the 18th annual Stollen Festival and walk around the city’s Christmas market. Apparently thousands of people attend Dresden’s Stollen Festival every year in search of a slice of Dresden’s famed Stollen, a Christmas cakey-bread like loaf that dates back to the Middle Ages. The crowds were certainly out this year as we shuffled along, shoulder to shoulder with our fellow stollen seekers. During our afternoon of sweet yeast bread, topped with icing, we sampled several types of stollen including one with raisins, one with candied orange and lemon peel, marzipan and poppy seeds and one that tasted rather alcoholic. We attempted to purchase a slice to bring back with us to Prague but to our dismay, the bakery booths only sold stollen by the pound (1, 2, 5 +) which was 15 slices too much for us; so we just stuck to the free samples. One of the main attractions of Stollen Fest is their yearly competition that involves baking a large Stollen for the parade. In 2007, apparently the bakers baked a stollen that was 4.2 kg which beat the original Guinness Book of World Records entry. Outside of sampling stollen, it is fun to walk around the packed laneways filled with food, regional delicacies, holiday smells, and gifts. We sampled a waffle with apfelmousse (aka apple sauce), doughnut bits dusted with white sugar, my fiance had a Bratwurst and we shared some candied nuts and an Alpine Sprizz (Aperol + mulled wine, which was not my favourite taste). While we would not rush back for a yearly pilgrimage, we were happy we had the chance to experience the hype behind Stollen fest. If you are looking for a couple good stollen recipes to try out, there is one here, and here.